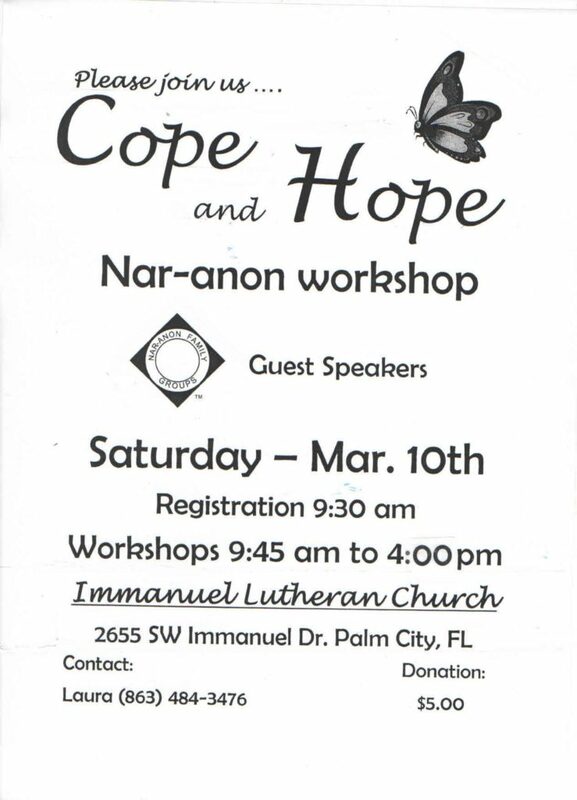 Cope and Hope, a Nar-Anon workshop will be Saturday, March 10 at Immanuel Lutheran Church, 2655 S.W. Immanuel Drive, Palm City. Registration is at 9:30 a.m. Workshops will be from 9:45 a.m. to 4 p.m. Featured will be guest speakers. Nar-Anon is a 12-step program for families and friends of addicts. Call 863-484-3476. Registration: 9:30 a.m. Workshops from 9:45 a m. to 4 p.m.